Sponsored by 101.9 RXP as part of their annual holiday concert series, My Chemical Romance headlined New York City’s Roseland on December 3. The band’s first trip to Manhattan since supporting The Black Parade, the event immediately sold out all three thousand tickets — a tiny number when compared to, say, Madison Square Garden, where the band headlined in 2008. Locals Fifteen Fleeting began the evening at 8PM with a stale take on radio-ready rock. The four-piece band did little to impress, sounding both dull and recycled, like on “Loud and Clear” which seemed to borrow from The Gaslight Anthem. 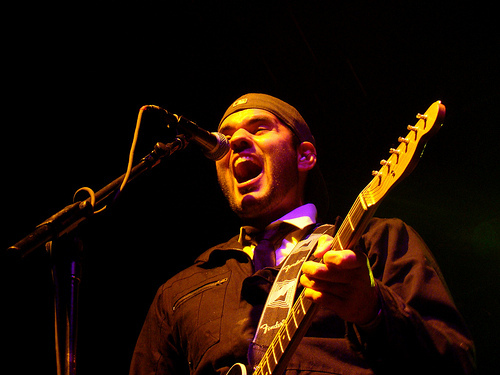 Other cuts from the band’s twenty-minute performance included “Brace” and “Away from the Sun”, but the five song set was generally unimpressive. The Gaslight Anthem wasted no time warming up an anxious My Chemical Romance crowd, the New Jersey natives diving in with “The Spirit of Jazz”. “Boxer”, without it’s signature introduction, followed, and a good portion of the crowd danced along to the 2010 cuts. Older fans appreciated “Boomboxes and Dictionaries” and “We Came to Dance”, while casual, radio-only fans were genuinely excited to hear singles like “Old White Lincoln”. Much praise has been given to The Gaslight Anthem’s live headlining performances, and most of that rings true when the band finds themselves supporting a much more popular act. Renowned for their twenty-five song or more sets, The Gaslight Anthem managed to fit fifteen cuts into just under an hour, an impressive feat accomplished by not wasting time with unnecessary banter or equipment changes. More importantly, Brian Fallon delivered a solid vocal performance with the rest of the band sounding as tight as ever. The band just started to heat up and gain the crowd’s favor with a potent string of “American Slang”, “Great Expectations”, “The ’59 Sound” when they returned to their trusty set closer, “The Backseat”. Normally a solid way to end the evening, the song appealed only to owners of The ’59 Sound and therefore left most of the young teenage crowd in the dark during the band’s final minutes, an unfortunate end to an otherwise rousing set that likely won the band a new demographic of fans. Just after 10PM, Steve Montano kicked things off for My Chemical Romance as he does on the band’s latest record with the “Look Alive, Sunshine” monologue, segueing directly into the touring six-piece’s explosive “Na Na Na”. Three Cheers for Sweet Revenge contributed the hooky-heavy “Thank You for the Venom”, the crowd drowning out vocalist Gerard Way by singing along to every word. A cover of Bob Dylan’s “Desolation Row” somehow worked, and, because the band had previously recorded and released the song for a movie soundtrack, much of the early-teen crowd sang along. “Planetary” begs for live treatment, and My Chemical Romance executed the brand new song with the amount of energy that renders its studio version obsolete. Mega-single “I’m Not Okay” followed, and Roseland appeared to peak in energy. That is, of course, until Way started to address the crowd. Hordes of young girls pushed forward for a chance to catch a closer glimpse of the frontman. Speaking over the introductory chords of the suggestive “You Know What They Do To Guys Like Us In Prison”, Way instructed all of the boys in attendance to take off their shirts. 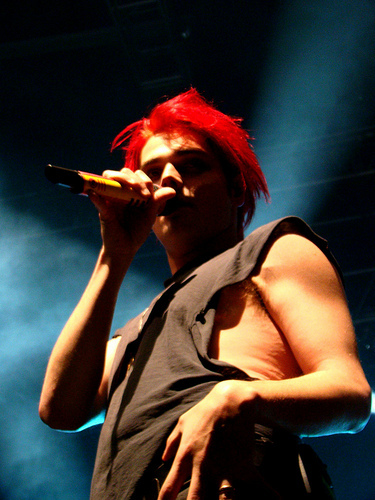 Shirts and bras alike flew through the audience as My Chemical Romance’s army of fans hung onto Way’s every word. The only logical thing for My Chemical Romance to do next was to give the sweat-covered crowd a breather. This came in the form of a slowed down, new version of 2004’s “The Ghost of You”. Things picked up when the drums kicked in for “House of Wolves”, though, and a great performance of “The Only Hope For Me is You” kept things moving along. “Mama” was more interesting than its fairly dull studio recording, and though “Welcome to the Black Parade” is a great album track, the song really shines live with Way straining his voice to deliver the song’s personal lyrics. Prior to “SING”, A Die Hard 2 remark from Way flew over the heads of a crowd largely born years after the excellent action film, but it didn’t matter when My Chemical Romance kicked into the solid Danger Days cut about singing for unity. Young and old, fans of the band sang together for “boys”, “girls”, and “the world”. “DESTROYA” was a similar full-scale singalong, and somehow the strange tune is as catchy as anything the band has written. “Helena” predictably closed My Chemical Romance’s set, but the band returned with “Cancer” (lead by James Dewees on piano) just moments later. 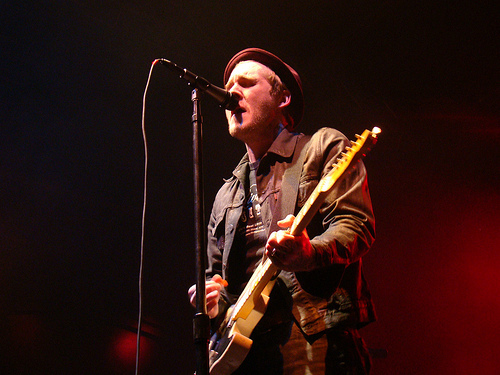 In a slot usually reserved for a hit single, the band’s last song was “The Kids From Yesterday” from Danger Days, released just two weeks earlier. My Chemical Romance’s rabid fanbase was already up to speed on the album, though, and the song was well-received and few fans on the floor were left in the dark to the track’s simple closing words: “We are the kids from yesterday, today, today”. Throughout the evening, it became clear that brand new tracks from Danger Days dwarfed My Chemical Romance’s old cuts, making songs like “Helena” or “You Know What They Do To Guys Like Us In Prison” sound hollow in comparison to the band’s thicker, improved sound. One third of the set came from the band’s latest record, a small preview of what to expect when the band goes on tour in mid-2011. Just as they performed The Black Parade in its entirety for quite some time, expect My Chemical Romance to take on much of Danger Days on their upcoming headlining tour. With this fourth full-length, the New Jersey band undoubtedly turned the page they were grasping at in 2006. All photographs by the incredible Kenami. You are currently browsing the archives for the Roseland category.